I recently bought manicotti shells, thinking of this idea to come up with something resembling manicotti. Tonight was a good opportunity as a good friend came over for dinner with his brother visiting from Spain. 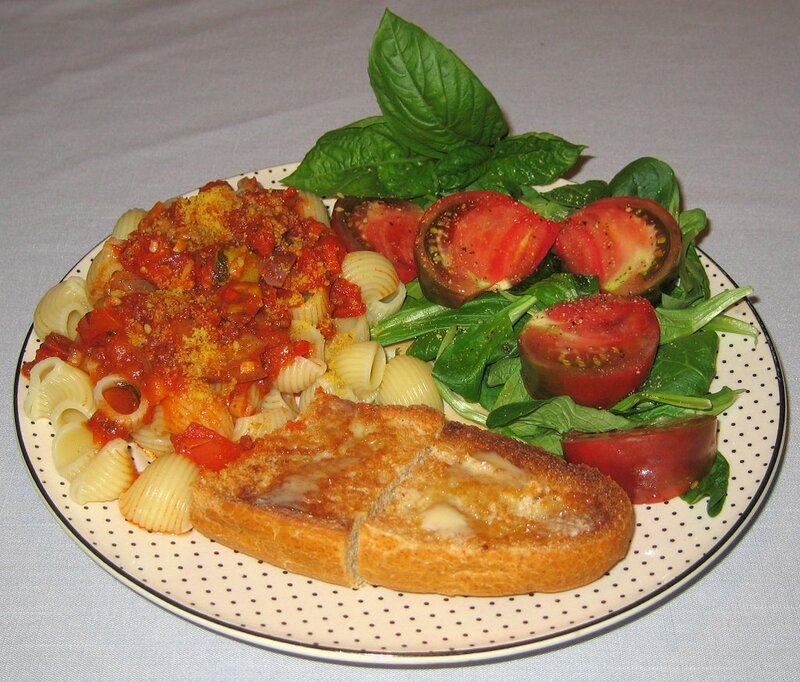 I made a hearty sauce, starting with a good organic tomato pasta sauce, and adding organic tomato paste to thicken it, oregano and basil from my garden, and grilled chunks of onion and bell pepper, and salt and freshly ground pepper. I quickly grilled vegan sausage and cut the links into two halves. I boiled the shells for about ten minutes till just done, then stuffed them with the sausage halves and put them in a baking dish, topping with the thick sauce. I baked, covered, at 350°F for about 20 minutes, and served with vegan Parm! "Parmesan cheese". It came out well and was filling, but I wasn't happy that the plate wasn't more attractive; it's difficult properly serving such stuffed shells. 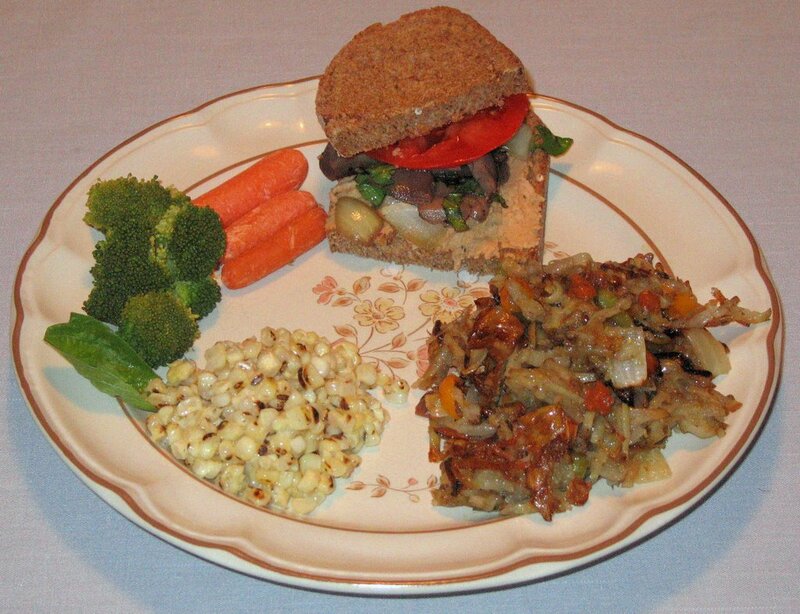 I'd like to try something like this again, perhaps with less stuffing or sauce, and maybe with tempeh as the filling. I also grilled some asparagus spears in lemon olive oil and served with Key Lime seasoning. A salad and carrot rounded out the dinner. Tonight I sauteed some tempeh and onion. 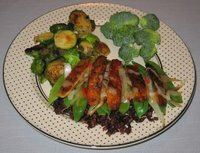 When the tempeh was nicely browned, I added some pea pods and quickly stir fried. I served this over brown and wild rices, along with a little bit of Drew's Thai Sesame Lime dressing/marinade. 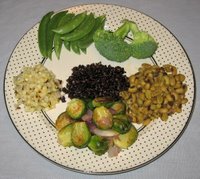 I also grilled some Brussels sprouts and served some raw broccoli, to make a green dinner. Tonight I made a fast dinner that I think came out well. I grilled medium-thin slices of organic Japanese eggplant, and I also grilled thickly sliced cloves of garlic. I don't normally buy vegan "cheese", but Sunergia Soyfoods now makes an organic vegan "feta cheese" that I found today; I bought the tomato and garlic flavor. The feta tasted decent and it had a strong fragrance, different from that of feta but reminiscent of it. 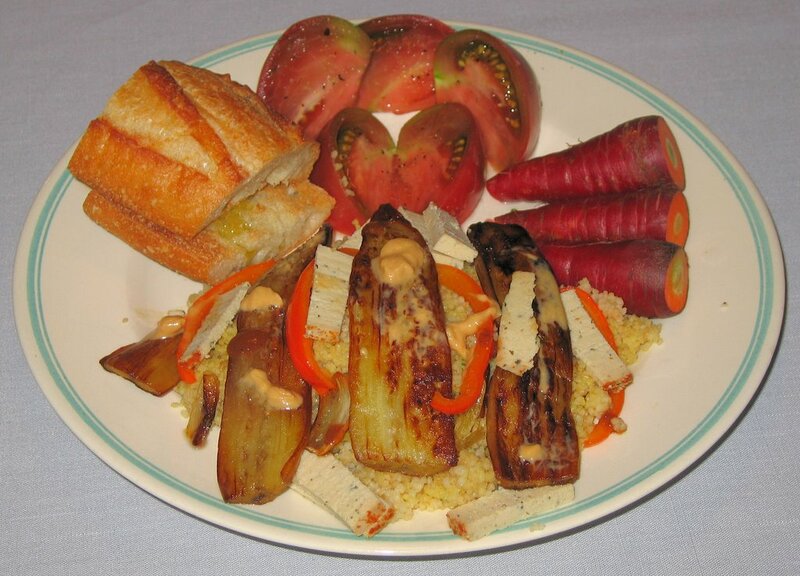 I served the feta with the dish atop whole wheat couscous, as well as very briefly grilled bell pepper slices. I topped the dish with a little bit of tahini and a few drops of a vinegar-based hot sauce. I also served toasted baguette with lemon olive oil, heirloom tomatoes, and baby red carrots. I have missed cooking! Last Thursday, we developed a problem in our kitchen which got resolved today. On Thursday we at at Whole Foods on our way to see a film. My parents had us over on Friday for my Mom's yummy homemade thin-crust pizza. We went to Charlotte, about 2 1/2 hours away, on Saturday to attend a classical Indian sitar concert, and ate at one of our favorite Ethiopian restaurants, Meskerem. 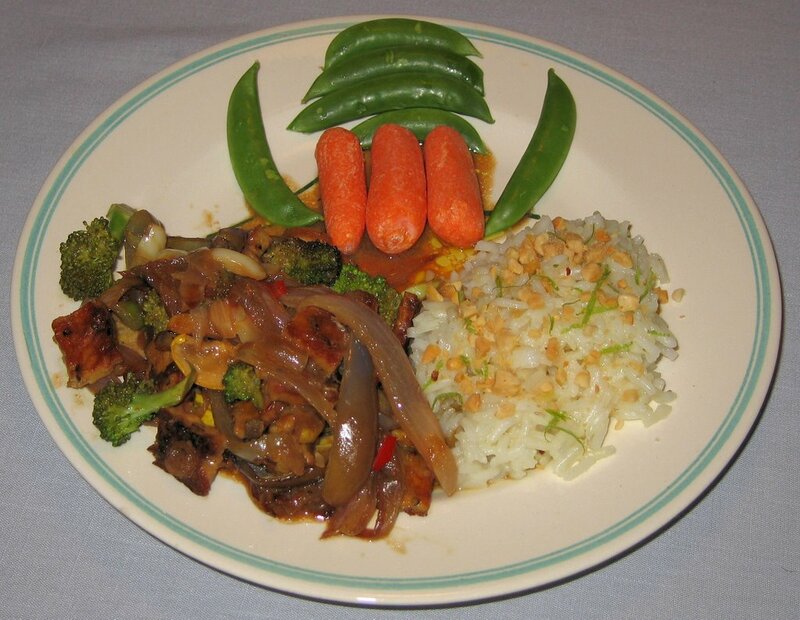 On Sunday, we attended the Carrboro Music Festival and ate at The Spotted Dog; they have some good tempeh dishes. Finally, we were back at my parents' yesterday for Indian food. 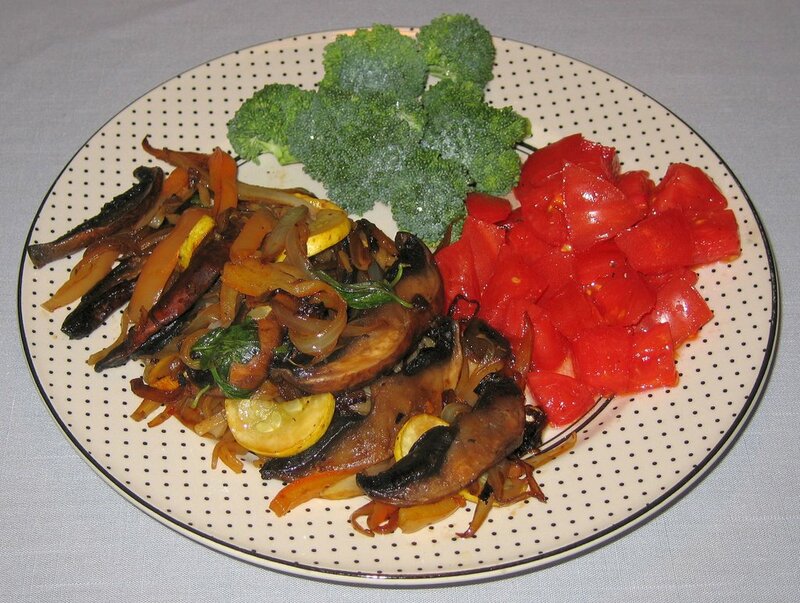 I sliced portabello mushrooms (two, one for each plate for my wife and me) thickly and sauteed them along with some vegetables, but kept the mushroom as the dominant ingredient. I soaked some wide rice noodles in very warm water for about 5 minutes then ran cold water through them and drained. I added the noodles and stir fried them quickly with everything else, adding some (too much, alas!) Caribbean hot sauce. I also made a simple Thai Tomato salad by dicing tomato and adding Ume plum vinegar, fresh lime juice, and salt. I've been reading a lot about Italy recently in preparation for a visit we're planning! We'll get great pasta and pizza there - I've been told that eggless pasta is common, and pizza dough is almost always vegan. From the UK Vegan Society's Vegan Passport, I already have this list of items to spout off that we can eat: Patate, riso, pasta (senza uova), fagioli, ortaggi, pomodori, frutta, noci, funghi; pane o pasticcini prodotti senza utilizzare grassi de origine animale; cereali e derivati, ecc. Zuppe e salse possono essere preparate utillizzando dadi di origine vegetale senza estratti di carne di ogni tipo. Per la cottura si possono utilizzare olii o margarine vegetali evitando burro e altri grassi di origine animale (es. Strutto). Grazie. 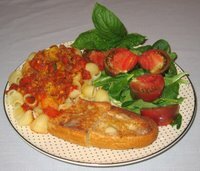 Perhaps because of my reading, I made what turned out to be a very nice pasta dinner tonight. I bought some seashell-shaped organic pasta made at the Montebello Monastery in Marche, Italy. The shells were thick and chewy, holding on to the sauce well. For the sauce, I used up the vegan Bolognese sauce that I had found in late July, and added lemon olive oil, Merlot wine, purple bell peppers, sliced garlic, red jalapeno pepper pieces, fresh oregano and basil pieces, small green olive chunks (I added these shortly before serving the sauce just to distribute them but not cook them), and a little salt; of course, to get a flavorful sauce, I let it simmer on low heat for some time. 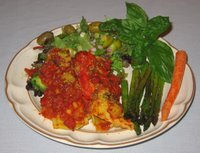 I sprinkled some vegan Parma! "Parmesan cheese" when I served it. I also prepared a salad with mâche and heirloom tomatoes with rosemary vinegar and artisinal extra virgin olive oil, as well as an organic wheat demi-baguette. Mangiare per vivere! Yesterday, we went to a film festival and, in order to have time to work out at our exercise facility, we ended up having to eat out. We stopped at Whole Foods Market and ate a variety of food from the hot and cold salad bars. As I had already mentioned, I went out to a South Indian restaurant on Sunday with and by request of a friend who used to live here and who was just visiting for one night. We went with my parents and had a good time; I had coconut-vegetable uttapam and shared idli (steamed rice cakes) and spicy sambar soup (idli and sambar is the prototypical South Indian appetizer), as well as pakora appetizers. 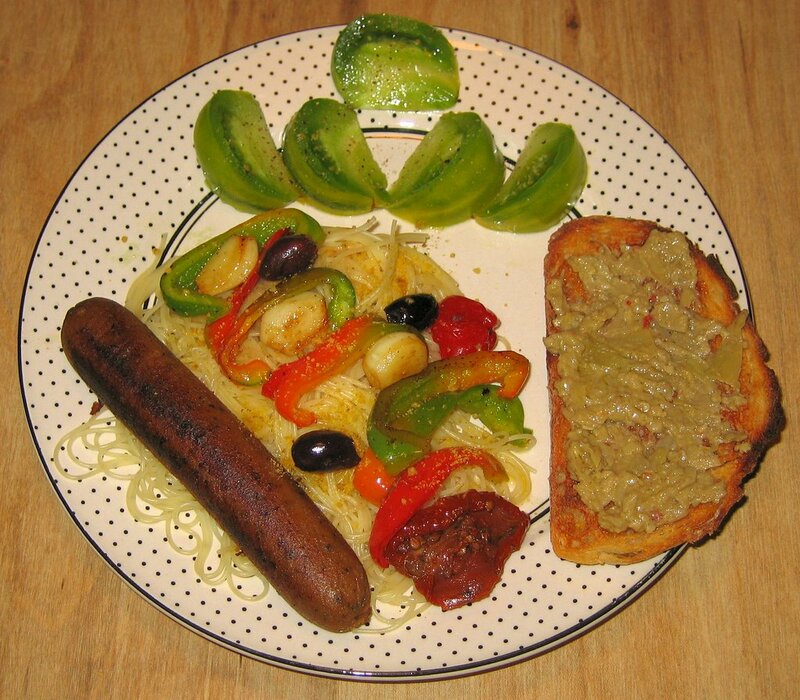 I have some apple-sage artisanal vegan sausage left to use and made something similar to what I did two Wednesdays ago. The product keeps well, and I am saving it for a dish that I want to make on the 29th, just under two weeks away, using manicotti shells as a base. Like I did two Wednesdays ago, I grilled the sausage and several cloves of garlic. I also grilled lilac bell pepper (it paled in cooking). I served the pasta, topped it with lemon olive oil, then added the bell pepper, sausage, and Eat in the Raw's Parma! vegan "Parmesan cheese". I also grilled some Brussels Sprouts, and served it with a little bit of the lemon olive oil, fresh ground black pepper, and Kermit's Fresh Lime and Datil Pepper. I was looking forward to making something like fajitas tomorrow, which I made long back for my wife (she loved them) and can now "repeat" :-) as she's away, for a good friend of mine who is visiting enroute back home on vacation. But my friend used to live here and I think enjoys my cooking, but also likes the South Indian restaurants we have. She said that she would enjoy the brunch I'm making tomorrow but would like to visit one of the restaurants as she misses them. Yesterday I didn't make dinner as I was babysitting. 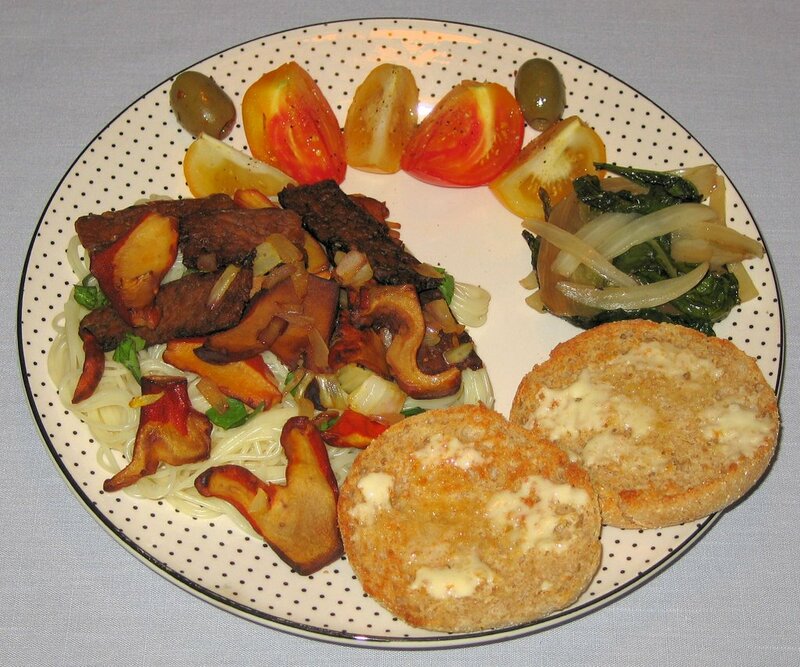 There, I had grilled portabella cap, raw vegetables, and baba ganouj and hummus. By the way, Steffie of Summerloco and her Mother visited from several hours away; they knew of my blog and contacted me to see if we could meet. We would have but timing just didn't work out. A friend came over for a quick dinner tonight before we went to an interesting Norweigan film. I loved the idea that I came up with about making marinated seitan sticks, both the first time in early August and a second time for a potluck dinner with mushrooms. I made the sticks in a similar fashion to that first time, but ran out of Consorzio organic Baja Lime marinade; I had some of their roasted garlic marinade, so used a little of it, plus squeezed fresh lime into the marinade. I served the well sauteed seitan sticks over quinoa cooked in vegetable broth. I also made whipped potatoes with a variety of ingredients, including minced shallot and, from my garden, thinly sliced basil. By the way, I'm a big fan of wikipedia, a collaboratively created encyclopedia, and have enjoyed contributing some information. Tonight I discovered wikiveg, a "that aims to become a one-stop free site for all things related to veganism, animal activism, vegetarianism, and related concerns"! My wife is away this week so for a little while I can relax my self-imposed challenge to prepare a unique dinner for her each night (which I've succeeded in doing since June 6, 2004, the day we met). Tonight I had a late night with some unexpected issues that arose, so I wanted to make a quick meal. 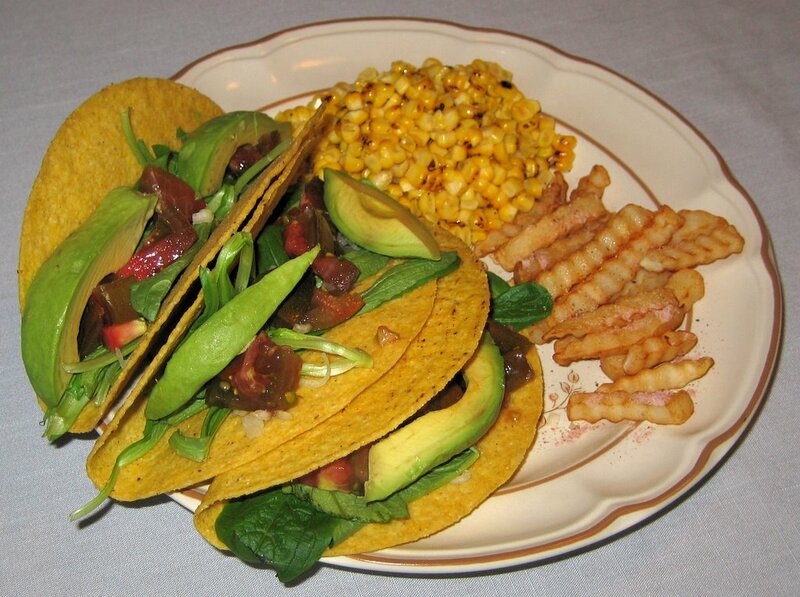 I made some tacos with heirloom tomatoes, avocado, shallot, and mâche ("lamb's lettuce") greens. I roasted some corn as I typically do, removed the kernels from the cobb with a knife, and mixed in salt, Earth Balance, and fresh lime juice. I also heated some frozen prepared French Fries. The result was simple but tasty and filling (there was actually more corn that I had when I finished what was on my plate; I had roasted two ears). There was no blog entry yesterday, Tuesday, because a good friend had his brother visiting from Spain and wanted to introduce him to one of his (and my) favorite foods, dosa. We went out to Udipi (the normal spelling of this set of restaurants inspired by the name of a South Indian village; but this location spells it Udupi) Cafe nearby and, joined by two additional friends, had a nice meal. I was honored to be the usher for a vegan wedding this past weekend; both of my friends marrying each other near lovely Asheville, NC are vegan, and the food at their Saturday wedding, catered by Amina's catering was all vegan and I think all organic! The dinner included lasagne (they made so much that we got to take a lot of leftover lasagne home with us; it didn't pack well so ended up being somewhat messy, but still tasty! 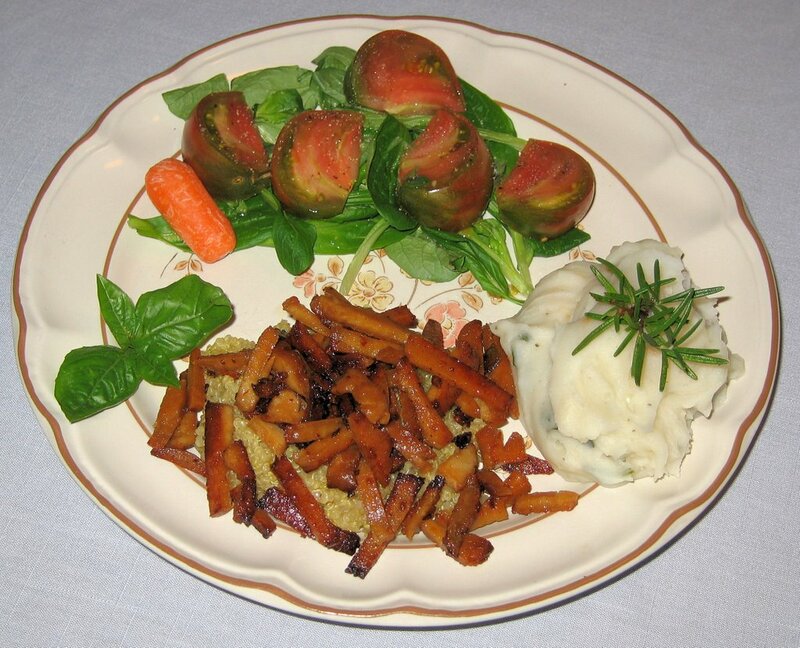 ), a big salad, chickpea loaf, mashed potatoes and gravy, cooked greens, corn on the cob, all manners of alcoholic and non-alcoholic drinks, a vegan cake, and fruits served with coconut cream. I still feel funny about going about normal activities on September 11th, and since those terrible attacks, always try to commemorate the loss of life by attending spirtual or educational activities. We were off to a September 11th film series, so I had to put dinner together quickly. I reheated the lasagne (delicious; I think it included nutritional yeast and a soy "sausage"), steamed organic Zephyr squash, and served, on toasted multigrain bread, green chili cilantro hummus from Asheville's Flying Frog Cafe. We left for Asheville on Thursday after dinner. On Friday, we attended the rehearsal dinner and had some tempeh brought in from Rosetta's Kitchen (an all-vegetarian restaurant open till 3a on weekends! ), and afterwards walking around downtown Asheville, tried some mango gazpacho soup at, I think, Ophelia's Restaurant. On Sunday, we ate at one of our favorite restaurants, Laughing Seed Cafe. We shared some pakoras; my wife had a raw food platter for her main course, and I had a delicious dish with pesto over seitan that I think I will use as a model for a dish in the future. I also enjoyed a refreshing cantaloupe sorbet to finish the meal. In addition to the main course of Brussels sprouts, I heated up leftovers of my wife's usal that she made a few days ago. Usal is made by sprouting black-eyed beans (or other bean) then making a curry by sauteing it in canola oil with mustard seeds, red chili, turmeric, a homemade spice mixture (made by my wife's Mom), and curry leaves. We had one ear of organic bi-color corn, so I couldn't resist grilling it and making it the way I like best, off-the-cob with Earth Balance non-hydrogenated margarine, fresh lime juice, and salt. I had the idea to marinating thinly sliced tempeh in an organic Baja Lime marinade, like I do with lime-seitan sticks, and making a kind of spinach salad. I didn't expect the tempeh to pick up as much of the marinade flavor as the seitan does (I was right). Well, I gave it a try and my wife and I enjoyed the result. I mistakenly thought that my wife prefers spinach at least steamed but not raw, and ended up with a dish that was more tempeh than spinach, but that was fine. I started my steamer going with fingerling potatoes; they took about 20-25 minutes to be tender enough to allow a fork's tines to penetrate with little resistance to the center. About 5 minutes before they were done, I put in organic baby spinach. 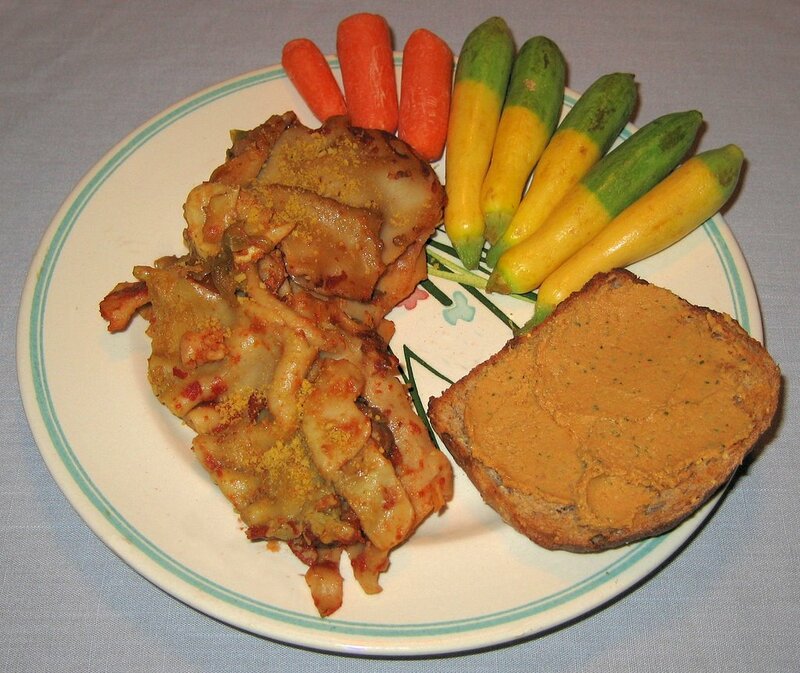 I had cut tempeh into small and thin pieces and had them marinating for over a half hour. I also cut in large pieces (so they could easily be fished out at the end) hot red pepper, which I added inside down, to the marinating tempeh. Periodically, I stirred the mixture and pressed down on the pepper pieces to get the capsaicin and flavor out. In my cast iron pan, I quickly browned pine nuts over low heat - watch out as they quickly go from a pleasantly done brown to burnt! I removed them then added oil. I have been interested in using more flavored oils, like the lemon olive oil that I used in the artichoke anniversary dinner a few weeks back, so yesterday purchased a nice lemon olive oil where the lemons and olives are pressed together, rather than the lemons' infusing the extra virgin olive oil. I used this oil (it smelled good and tasted good - but when the bottle is over, I'm going to buy a more expensive Meyer lemon olive oil) to briefly saute the tempeh, leaving behind any non-absorbed marinade, and coarsely chopped red onion. I put the spinach and then tempeh into a bowl, mixed in seasonings like Kermit's Fresh Lime and Datil Pepper, the browned pine nuts, and freshly picked oregano leaves from my garden, and served. I cut slits into the potatoes and added a little bit of the lemon oil along with salt and pepper. I also served two kinds of heirloom tomatoes. We enjoyed the meal! 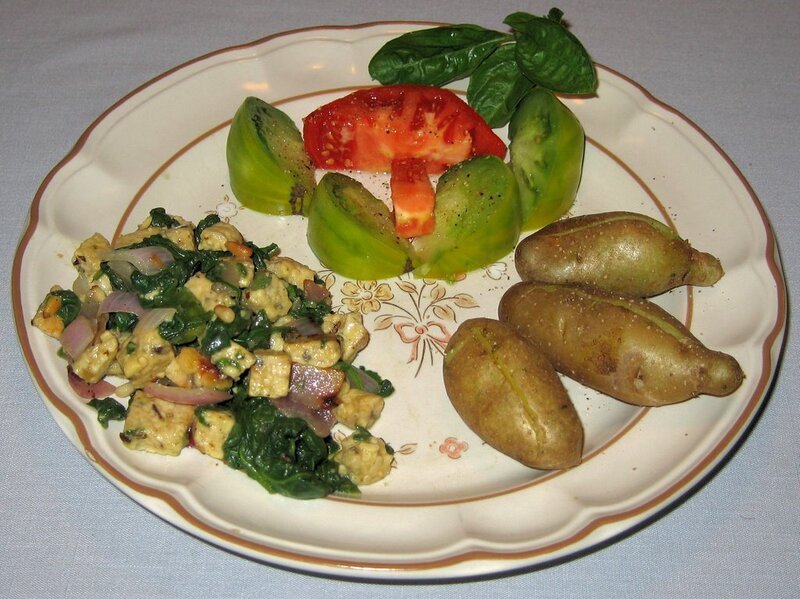 I'd like to try this again more like my original vision of a salad with raw spinach. 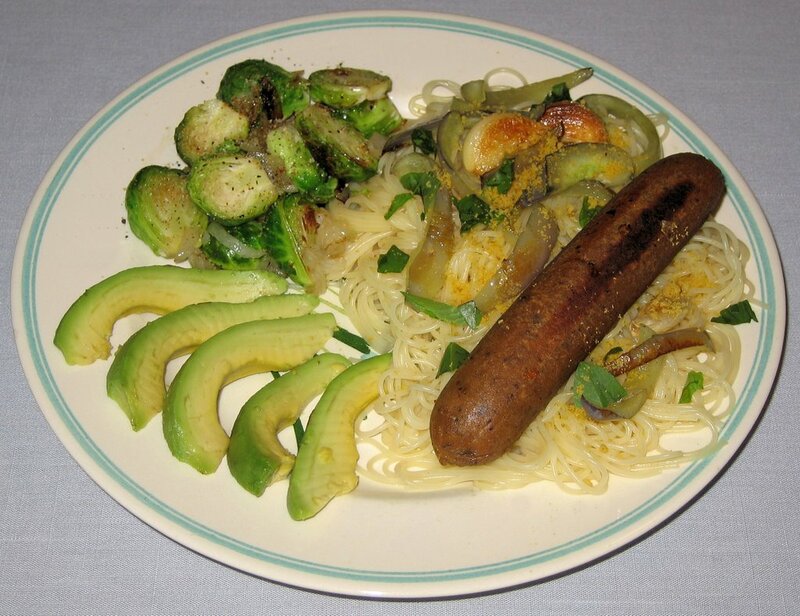 Or I might steam the spinach but use the lime-seitan sticks that we love so instead of tempeh. Tonight I made a version of Indonesian Tempeh and Vegetables substantively similar to one that I teach in my cooking class. I sauteed in a cast iron pan some pieces of tempeh (in class, I have students cut the tempeh quite thin, but used thicker cuts tonight perhaps by way of shortcut :-) ). In another pan, I began sauteing red onion. 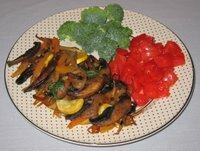 A few minutes later, I added thinly sliced garlic, then a minute or so later, broccoli crowns, yellow squash, and purple sweet peppers. I mixed in the tempeh then reduced the heat, and added half of a can of organic reduced fat coconut milk, a splash of soy sauce, fresh organic Hawaiian ginger, a little bit of hot red pepper, and some fresh lime zest. I simmered for a few minutes and served after mixing in a little salt and freshly ground black pepper and a little more zest. I hate to get white rice, but wanted white Jasmine rice to eat this dish with; I cooked it in a little bit of broth (ratio 1 rice to 1.5 liquid, covered and simmered for about 20 minutes) and put fresh lime zest and ground peanuts on top. By the way, I recently heard about the benefits of raw cacao bean pieces (nibs), proving the "food for the Gods" to us mortals without added sugar or other additives. Chocolate is said to be mood heightening, but the sugar can then plummet one's energy. Apparently raw cacao has the pluses and not many of chocolate's negatives. I have had Sharffen Berger Roasted Nibs some years ago, but today purchased the raw Wholly Cacao, a combination of organic raw chocolate sweetened in this mixture with Himalayan Hunza raisins. We enjoyed a teaspoonful or two of this treat for dessert after dinner. I went with a friend to see a very nice larger-than-life outdoor puppet show, “As The Crow Flies: tales from four directions”, by Paperhand Puppet Intervention; my wife had to rush home for some work matters. After the show, we all ate together. I put together a quick meal that I think was reasonably tasty. I periodically make brunch, and often make hash browned potatoes then. I am picky with my first meal and don't like onions, garlic, or anything heavier than plain hash browns. Tonight I put together a hash brown, but included onions, sweet peppers, and toasted arbol pepper hot sauce. I am so happy that organic corn is finally available, and love making roasted corn with Earth Balance non-hydrogenated margarine, lime juice, and salt. I also made a sandwich with whole wheat bread of tomato-basil hummus with tomato and a mushroom saute (I sauteed a few types of organic mushrooms and, when they were almost done, put a little Merlot red wine in, and shredded fresh basil; I mixed in some freshly ground black pepper and salt). Yesterday, we attended a wedding reception with good Indian food. I couldn't believe how good the kachoris (referenced below; vegetables in flattened dough, fried) were! We also enjoyed good rice and several vegetables at the all-vegetarian and mostly all-vegan spread. According to fzelders.nl/weblog, a meme is "an idea, project, statement or even a question that is posted by one blog and responded to by other blogs. Although the term encompasses much of the natural flow of communication in the Blogosphere, there are active bloggers and blog sites that are dedicated to the creation of memes on a regular basis". Today I was "tagged" with a meme coincidentally by both Chris at Eat Air - A Vegan Food Log and primaryconsumer at A day in the life of a vegan. The meme, started by The Traveler's Lunchbox on August 21, asks food bloggers to select five "top picks for things you've eaten and think that everyone should eat at least once before they die". They already have 163 people (and 163x5 = 815) responses. A good rava masala dosa. 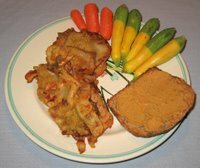 I am currently excited about my idea from about a month ago of creating lime-seitan sticks, but that may be a passing fad. Perhaps a fresh from the oven hot sticky bun from Sticky Fingers Bakery (Washington, D.C.)? How about some divine dark chocolate of more than 65% cocoa content - such as from Sharffen Berger, Chocolove (especially their hand-numbered single-origin vintage Chocolatour bars), Endangered Species (especially Deep Forest Mint, Supreme Dark, and Dark with Cocoa Nibs)? I can list only five?! 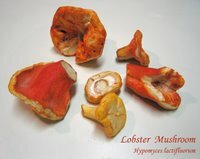 Yesterday I found lobster mushrooms (not really a mushroom but rather a mold that envelopes a host mushroom and gives it the reddish-orange color that, apparently, cooked lobsters have) on sale; still expensive (around $20 a pound), I bought a small quantity that added up to $5. Before preparing them today, I did a little research on the web and found that some didn't particularly enjoy the flavor, and found some advise to slice these "mushrooms" thinly and cook longer than one might cook other mushrooms. I had some smoke-flavored organic "fakin' bacon" tempeh waiting to be cooked and finished. 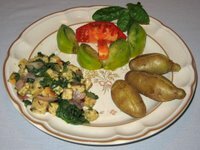 I started a saute going with thinly sliced lobster mushrooms and soon thereafter added the tempeh. I let the saute go for about 10 minutes, adding finely chopped onion just a few minutes before finishing to let it remain non-carmelized. I'm glad I did that because the resulting dish didn't need any more strong flavor. It was good served over a simple pasta and artisinal imported olive oil, but I wish I had used standard tempeh and not smoked, as the flavor was a little overpowering of the mushrooms. The lobster mushrooms tasted fine to me but really I like even white button mushrooms better, so the cost will probably prohibit me from buying them again. The sauteed lobster mushrooms were somewhat tough and of mild flavor. I also had some braising greens left over from day before yesterday, so served them as well. An English muffin, tomatoes, and olives rounded out the meal.